The Martha Stewart Living Modern 1-3/16 in. Bedford Nickel Discus Knob features a contemporary look with a slightly convex surface. The knob is finished in Bedford nickel and is easy to install when rear mounted. Limited lifetime warranty. The Amerock BP55271BBR Blackrock 1-3/16in(30mm) LGTH Knob is finished in Black Bronze. The BlackRock collection offers sleek simplicity with a contemporary indulgence. This eclectic line boasts bold shapes and sizes. Black Bronze is a warm and slightly textured dark finish which nods to the softer side of Black without losing the richness of the Bronze feel. The Amerock BP55271PN Blackrock 1-3/16in(30mm) LGTH Knob is finished in Polished Nickel. The BlackRock collection offers sleek simplicity with a contemporary indulgence. This eclectic line boasts bold shapes and sizes. A modern metallic finish, Polished Nickel offers the beauty and luster of sterling silver without the cost or care it takes to maintain. The Amerock BP4258WN Inspirations 1-3/16in(30mm) DIA Knob is finished in Weathered Nickel. Clean, classic lines in a casual relaxed style, Inspirations is designed to compliment any dicor. Weathered Nickel is a brushed, textured accent that adds dimension to the silver tones of Nickel while accenting the intricacies of each design. 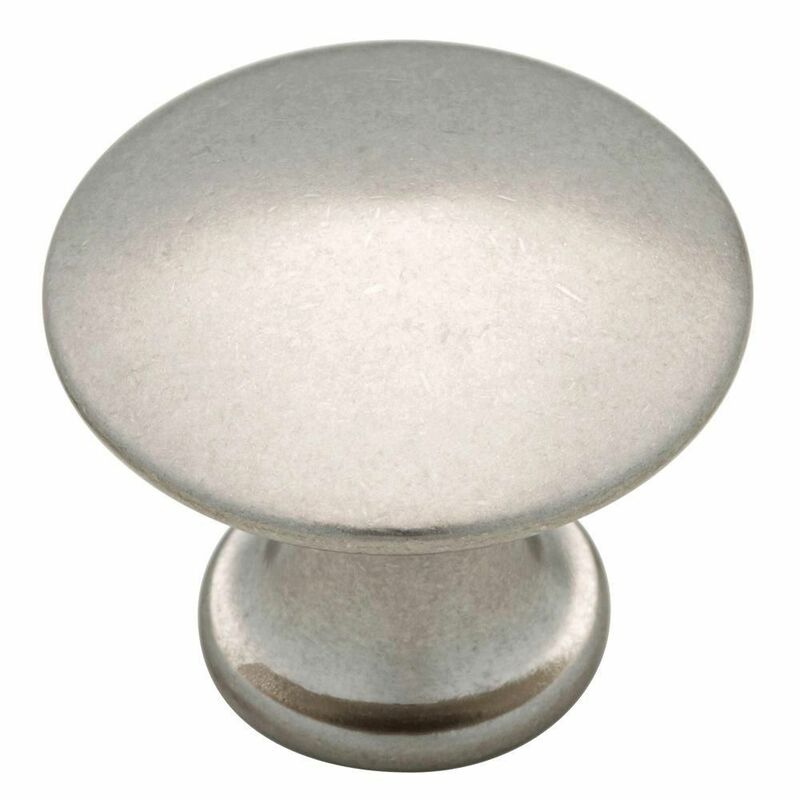 31mm Discus Knob The Martha Stewart Living Modern 1-3/16 in. Bedford Nickel Discus Knob features a contemporary look with a slightly convex surface. The knob is finished in Bedford nickel and is easy to install when rear mounted. Limited lifetime warranty. 31mm Discus Knob is rated 4.2 out of 5 by 5. Rated 5 out of 5 by Carole from My kitchen cabinets look great with the new knobs.... My kitchen cabinets look great with the new knobs. Rated 5 out of 5 by Canoegirl from The discus knobs are modern, sleek, and look great on our new cabinets. They pair well with the M... The discus knobs are modern, sleek, and look great on our new cabinets. They pair well with the Martha Stewart cylindrical pulls. Rated 1 out of 5 by Hibu from Actual product isn't like the store display. I really liked the sample on display at my local Home Depot store. However, the actual knobs delivered were quite different from the sample - less polished, marred and industrial looking (not a polished satin nickel finish). I was very disappointed and returned the set of 24 I had ordered. Rated 5 out of 5 by Pete from Solid quality and finish We bought just under thirty of these knobs to replace all of the hardware in our kitchen. The feel of the knob is solid and the finish looks great. I haven't found one that I had a problem with yet. My only wish is that the handle part is a bit thicker, but that could be just because I'm not used to it yet.